In November I wrote a short post about Tina Seelig's Innovation Engine. As I've now come to the end of her book inGenius, I want to write more about this and how all the different parts of the engine connect. Seelig divides the engine up into the inside and outside. On the inside, creativity is influenced by knowledge, imagination and attitude - this basically draws on Bloom's work about how learning is connected to what you know, do and feel. Knowledge fuels your imagination because the more you know about something, the more you have to work with. Your imagination is what allows you to create something new. Studies have shown that imagination is connected to memory as the same parts of your brain are invoked in remembering and imagining. Our imagination transforms what we know into new ideas, and it is an endlessly renewable resource. Our attitude, sometimes referred to as our mind-set, determines how we interpret and respond to situations. Brain research shows that people who believe they can learn from their errors have different activity in their brains when they make a mistake when compared to people who think their intelligence is fixed and who therefore don't try to learn from their mistakes. Carol Dweck makes the point that our mind-sets are malleable - the messages we tell ourselves and that others tell us influence us and how we see the world. 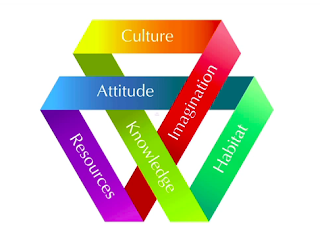 The habitats, along with your attitude, influence the culture of your community. Creativity can be enhanced by honing your ability to observe and learn, by connecting and combining ideas, by reframing problems and by moving beyond the first right answers. You can boost your creative output by building habitats that foster problem solving, crafting environments that support the generation of new ideas, building teams that are optimized for innovation, and contributing to a culture that encourages experimentation. Can creativity be taught and learned? It certainly seems that we can do a lot to foster it.